Kids getting sick, and you not able to do anything to reduce their pain, is the most miserable situation a mom can be. Last 2 weeks was a nightmare for me. Kiddo was down with severe cold and cough for one week, followed by fever the next week. It was sleepless nights, check fever every 3 hrs, giving medicine every 6 hrs… poor kid, he never complained. All he wanted was a big hug from mommy and sleep in her arms. Finally today he is feeling a lil better, and so am I. He got back the bright smile and twinkle in his eyes and I cannot ask for more. 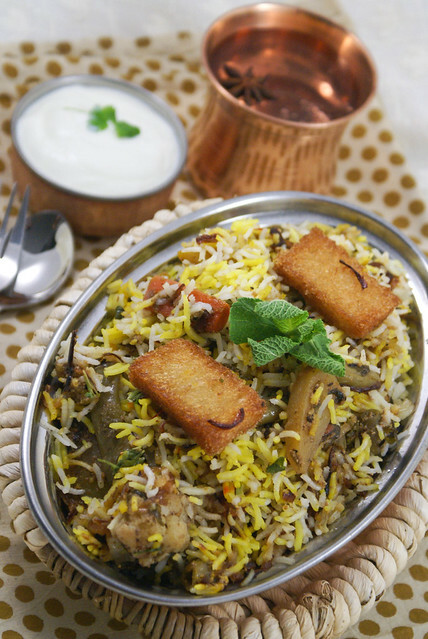 So come and join me to celebrate with this absolutely delicious, Vegetable Biryani. Do not worry about the long list of ingredients, just follow the steps and see how easy it is! Wash rice, in several changes of water till the water runs clear. Soak the rice in enough water for at least 30 min. Add 6 cups of water in a big heavy bottomed pot. Add in all the ingredients from Bay leaves to Salt. Drain rice, and add it to the water. You will need around 3 – 4 Tbsp of the masala powder, the remaining powder can be stored for future use. Slice onions very finely and add cornflour and sugar and mix well. Fry them in the oil in batches, till they turn brown. Drain them on a paper towel and keep aside. Add oil in a deep wide pan. When oil is hot, add in whole garam masala. Fry for a minute and add ginger and garlic pastes. Fry till the raw smell disappears. Add in vegetables. Fry on medium heat for few minutes. Add in salt, 2 Tbsp of masala powder and fry well. Add in curd and mix well. When the veggies are almost, around 75% done, add in lemon juice and half of coriander and mint. Sprinkle half of fried onions. Now layer the 3/4 th cooked rice. Pour the melted ghee on the rice. Pour the saffron milk all over the rice. 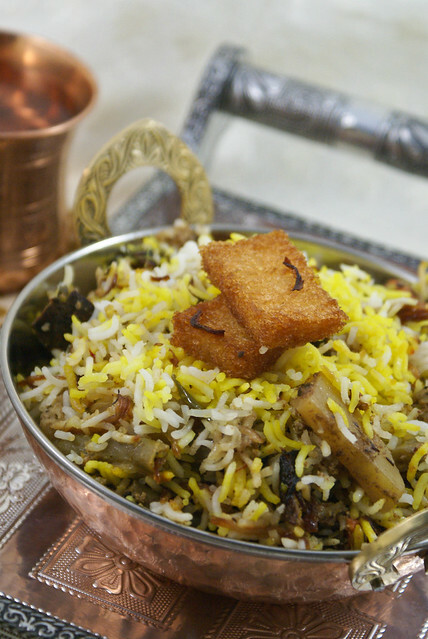 Similarly sprinkle the rose water evenly all over the rice. Sprinkle 1 Tbsp of masala powder, add the fried nuts and on this layer remaining half of fried onions and coriander and mint. Cover the pan with an aluminium foil and place the lid tightly. Cook on very low heat for about 30 to 45 minutes. Serve hot with raita or Shorva. Add fried bread slices while serving for the extra taste. It really enhances the looks and taste of the dish. Adding Rose water is purely optional.. it gives a unique flavor to the rice. The extra masala powder can be stored and used in other biryani’s or gravies. Making the fried onions when you have lots of free at time at hand , and storing them reduces half the work. Goes with the name…..looks extremly royal and yum…. Best reason for celebration! 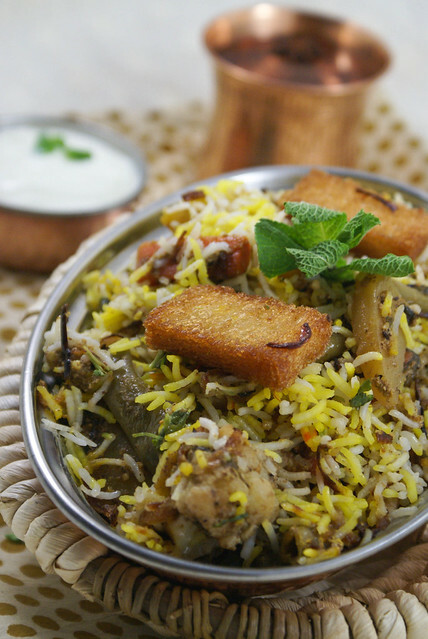 That too with nutritious biryani which is a feast for eyes too. Hope Ansh will enjoy it. Those fried bread pieces are the icing on the cake..lovely! 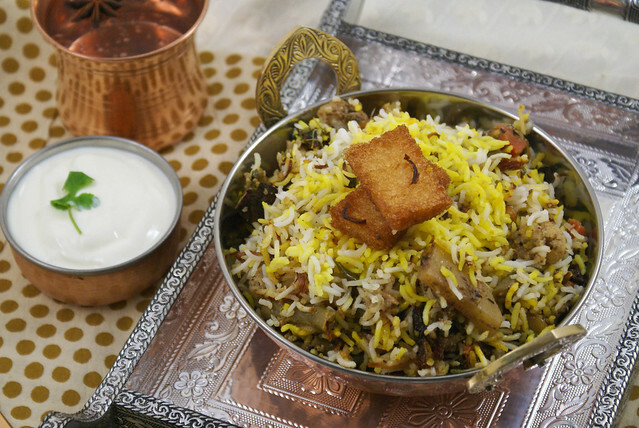 And the biriyani looks very much royal as the name suggests.